Happy Tuesday friends! As you may know, our kids love themselves some Minecraft! We’ve shared our very popular Minecraft Valentines (we also have a pink girl version) and Minecraft Halloween Wrappers in the past! 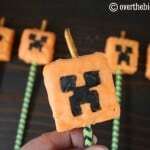 My Nathan has been loving Rice Krispie Treats lately, so as a fun activity over Fall Break we made Minecraft Creeper Pumpkin Rice Krispie Treats! I took the pre-made Rice Krispie Treats and cut them into squares (of course the kids loved eating the extra part)! I melted the Orange Candy Melts in the microwave according to the package. 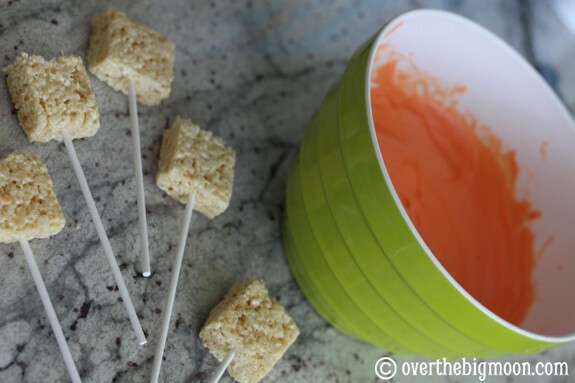 Then I put the Rice Krispie treat on the end of a fork and dipped the whole thing into the melted Orange Candy Melts. Lightly tap the dipped Rice Krispy Treat on the edge of the bowl or cup, to drain the excess candy melt. It dips much thicker then you need and/or really want. I then placed the dipped treat on wax paper to dry. 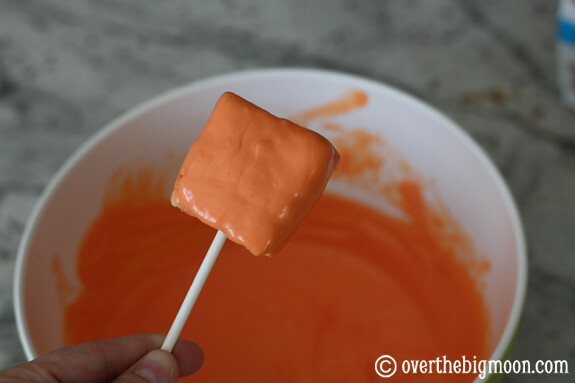 An hour or two later, go back and put in the Pretzel Stick for the stem and your candy stick. Then allow it to finish drying really well. I usually leave it a few more hours. 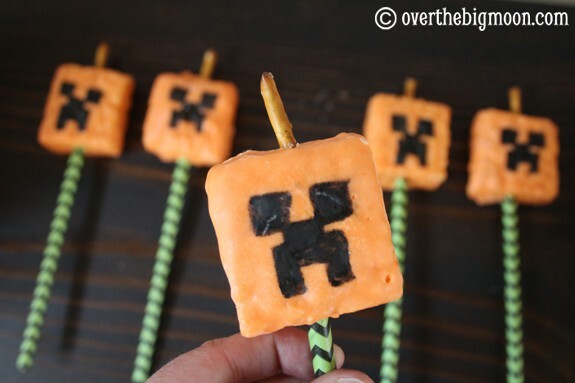 This would make such a fun treat for a Halloween Party or just a Saturday activity with your kids! Enjoy! I tried it! Works great!